Welcome to the "Peter Howgate Award", a travel grant presented by the International Association of Fish Inspectors (IAFI) to a young fish technologist who has shown a promising start to his or her career. The Peter Howgate Award pays for the attendance of the selected candidate to the biennial IAFI World Seafood Congress. In the past this has been held in Sydney Australia, Agadir Morocco, Washington USA, and St.John's, Newfoundland Canada. The Award is a tribute to Peter Howgate's work and career, and a recognition of his immense and ongoing contribution to the field of fish technology and the people who work in it. The Award was set up by fish technology professionals around the world, with the help of the Seafood HACCP Discussion List community and was adopted by IAFI in 2014. The award is open to anyone presently employed in any relevant position involving fish technology from any country. Relevant positions include commercial fishery sector, research or inspection roles. To be eligible for the prize, applicants must be under 30 years of age. Download more information and an application form here or email us at megapesca@mail.telepac.pt. The International Association of Fish Inspectors (IAFI) was established in 1999 to serve the world fish inspection community. IAFI exists to promote the exchange of ideas and information, foster interaction, understanding and professional collaboration among individuals, organisations, and governments, disseminate knowledge about seafood and associated products inspection, and promote advancement of the state-of-the-art in fish inspection research and education. For more information visit http://www.iafi.net. Everyone who has benefited from Peter's assistance is invited to write a dedication by clicking on the Comments link below. Remember to include your name, email address, position and organisation (if relevant). Thanks Peter for all you have done. 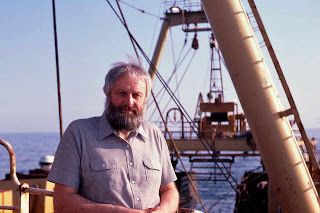 I know I am not alone in being helped by your going way beyond the bounds of duty when I was a young and inexperienced fish technologist, back in Stranraer in 1979. You wrote me many long and detailed letters on how to set up my experiments and analyse the data, patiently answering all my questions, and brought me to your laboratory in Aberdeen to work with you. Your humanity and openness are a guiding beacon in my career, as they are to many others'. Thankyou. Thank you Mr. Howgate for setting a very high standard in your communications, and never loosing professionalism, humor, or your excellent scholastic bearing while providing information to the spectrum of seafood participants around the world. You have a greatful audience and countless millions are the recepients of your many contributions. Peter Howgate is a person who has always demonstrated respect, dignity, superbly focused abilities, and the higher course for those selected to have vision toward Truth, Purpose, and our Common Destiny. Peter is a person who has lived a life worthy of emulation. My thanks to all who make this annual award in recognition of Peter Howgate possible. You have raised your eyes toard the focus of his vision for us and our future, working and living together! Find the light in this opportunity and make it brighter and encourage others toward this goal. With this we share a little bit of his life, and that joy we find, can't be denied. Peter is an inspiration for all fish technologists. His valued contributions continue to benefit us all. Peter Howgate is the consummate seafood scientist and technologist. His expertise and dedication to improve the quality, communication and understanding of seafood science worldwide has been an invaluable gift to the seafood community for decades. I welcome all colleagues to contribute to the Peter Howgate Award to show your appreciation and gratitude for his selfless sharing of knowledge to advance the field of seafood science and technology, and to recognize outstanding scientists following his lead. I worked with Peter at Torry Research Station for 18 years, as well as on a DANIDA project in Sri Lanka. When climbing with him in the Cairngorms I found him a wonderful close neighbour when one has to be cantilevered, single handed, off rocks embedded in snow! You were with us at The Federal Dept. Of Fisheries, Nigeria as an FAO Consultant in the early 80s. You were very conscientious in your work with us. I am really happy to know that you are continuously being honoured whilst alive. Congratulations.